GCF Board members flank Rachel and Duane Goossen (middle) at the April 21 recognition dinner. Pictured are (from left) Dwight Flaming, John Fast, Peggy Jay, Rachel Goossen, Duane Goossen, Elaine Unruh, Myron Schmidt, James Voth and Carol Duerksen. 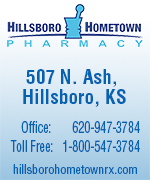 The goal of the board is to raise an additional $75,000 by Dec. 31, 2020. The Goessel Community Foundation, an affiliate of the Central Kansas Com­mun­ity Foundation, awarded five grants April 21 at a recognition dinner hosted by the foundation board. ◼ $1,000 for Bethesda Home, $950 from the Goessel Senior Endowment and $50 from the Impact Fund to supplement expenses for the Friendship Meal Program. ◼ $500 for Families and Communities Together (FACT) from the Impact Fund for literacy kits and supplies for children age birth through 5 years who attended Goessel Elemen­tary School Sensational Senses community event. ◼ $500 for Marion County Fire District No. 2 from the Impact Fund to supplement the cost of replacement radios. ◼ $500 for Goessel Public Library from the Impact Fund to help fund STEM (Science, Technology, Engineering, Math) after-school activities. ◼ $500 for the Tabor Food Pantry from the Impact Fund for purchasing supplies and Keith’s Foods cards needed by the pantry. ◼ $420 for Heart to Heart Child Advocacy Center from the Impact Fund for two anatomic dolls for their work with victims of child abuse. Duane Goossen, former 74th District representative of Kansas, now living in Topeka and working for Kansas Center for Eco­nomic Growth, was the featured speaker. He shared values learned in his early years growing up in Goessel that have shaped his career. 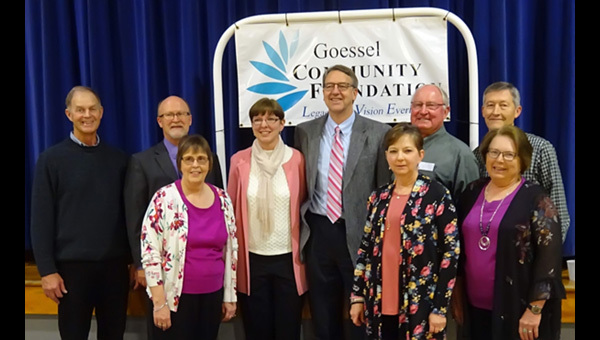 Dwight M. Flaming, with assistance of board members, highlighted the three-year capital campaign, “Giving Back to Goessel” demonstrating various ways of giving to the Impact Fund. 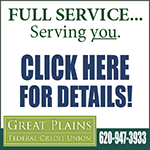 The goal of the Founda­tion is to raise an additional $75,000 by Dec. 31, 2020. The Goessel Impact Fund is an unrestricted grant-making fund that allows GCF to grant to a variety of needs and causes. To participate in meeting the needs of local charities, send your tax-deductible contribution to Goessel Community Foundation, P.O. Box 244, Goessel, KS 67053.